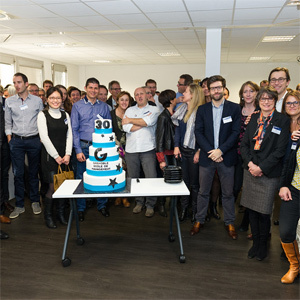 The 29th of November was a landmark occasion as we welcomed 150 graduates on our Paris campus to celebrate Grenoble Ecole de Management's 30th anniversary. Alumni and GEM staff were present throughout the day and into the night forthe Network Gala. Before cutting the anniversary cake, Judith Bouvard, dean of GGSB and the GEM Paris campus, kicked off the event with a speech. Thierry Grange followed up with an unconventional speech, as we have learnt to expect! His words lingered on long after his speech and warmed the hearts of those pioneering graduates who were attending. Many alumni participated in this celebration and applaud Thierry, an icon of their success. The afternoon had a friendly business atmosphere with 11 conferences in English and French on current themes such as Serious Games, Geopolitics, Social Entrepreneurship and well-being at work. The showroom was hosted simultaneously and offered graduates the opportunity to showcase their products to other alumni. The afternoon was an excellent opportunity for participants to network and exchange freely. Five graduates took advantage of personalized coaching sessions with Anne Caroline Moeller (GEM ESC '92).This first edition was considered a great success and will become a regular feature of the Alumni Relations calendar. The next showcase will be held on November 28th in Paris and we will keep you posted on a UK version soon to be held in London. View the list of graduates present at the showroom. In the evening, over 300 participants, exhibitors and organizers gathered together at the Network Gala organized by GEM GN alumni association. The night came to a close in the early hours of the morning as the last hardy participants took their leave. As always, it was a pleasure to help, share, support and exchange with all of you. Our strength lies in our network and we thank you for your participation, your smiles, your laughs, your tears and the spark that lights up your activities every day.